Power outage at our place. Happens every now and then, just a fact of life when living in a rural area. So out with the candles and lanterns. I just loved power outages as a kid, board games and ghost stories were sure to follow. But today, when the outage occurred I was painting a cover for a children’s picture book. The candles and lanterns did not cast enough light to paint, not a book cover anyway. I decided to start a piece that’s been on my mind for a while. It was moving along nicely in the glow of the candlelight. Then it was time for fresh water. No water. We are on a well. No electricity = no water. I began plotting for water. Would it be decadent to paint with bottled water? Would the water in the pond be too muddy from the rains? Perhaps some water out of a downspout? In the midst of plotting for a water source, Tim arrived and we discussed setting up the generator. He did get a little one out of our RV up for lights. Then voila…the power company had the main electricity back on. Isn’t that how it goes? 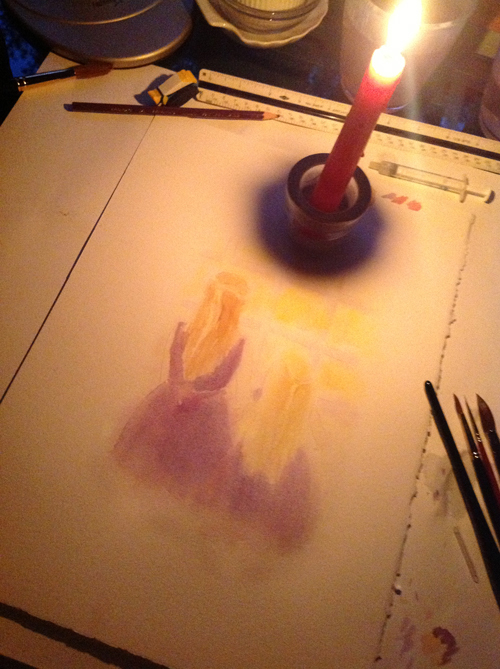 Work in progress being painted by candlelight. Here is the ‘by candlelight’ work in progress. I may have to finish it by candlelight. For now, back to the book cover. This entry was posted in Art, Child's perspective, Reflections, Watercolor and tagged Art, candlelight, Children's Books, Inspiration, photography, Watercolor by MaryALivingston. Bookmark the permalink. Beautiful and even nicer under candlelight. Such a wonderful “work in progress”. Thanks, I look forward to finishing it. I love the candlelight effect on that photo! You would’ve never gotten such a glow in ” real ” light. To me, it would’ve been a photo I would’ve kept preciously as a memorabilia. Nice start for a cover! This photo is with naked lens NO effects applied. It IS real light from the candle, no other light source, no digital trickery.I save my creativity for the brush. This is not the cover, this is what I started while the power was off. I don’t have permission from the publisher to share the picture book cover – not yet, anyway. ha, ha, lol, okay, I’ll remove my foot from my mouth…I am often asked what “effect” I use for photos. Funny, though, as a retired photographer “real” light is the existing ambient light in the room. The rest, supplied with bulbs etc. is called artificial. What a great way to turn lemons into lemonade. Now that the power is back, I have returned to the book illustrations. I may just have to cut the power and light the candle to finish this piece. Love the story. Looking forward to the finish of of both projects. what a great story! we lose power a lot here, and i often grab a flashlight to reach a stopping point. i admire that you kept painting! Made me realize how I take technology for granted. Our longest span without power here has been 16 days. We are pretty prepared with generators and such. Just something special about the light of a single flame. Love your story! My last house (on the next street over) lost power every time there was an idea of lightening, also on a well. When I heard thunder I unplugged the computer and lit the candles. Bravo for continuing your illustration! The no water issue is probably the hardest. Thanks for stopping by. I love your art, especially the dogs. Indeed! I was so happy when we got satellite over dial-up, then just a 2 years back line of sight wireless reached us. I wouldn’t trade where we live for the world. I agree about not living anywhere else. I do love the cities for their culture scenes, but I always want to go home. I used to love power outages when I was a kid also. I would hide some place and when one of my three sisters came by, I would give them a rousing Boo!